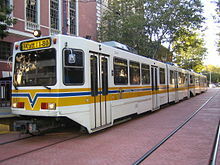 The Sacramento RT Light Rail system (reporting mark SCRT) is a 42.9 mi (69.0 km) light rail system, consisting of three rail lines, 54 stations, and 76 vehicles. It is operated by the Sacramento Regional Transit District. Sacramento's light rail system, with an average of 36,800 weekday daily boardings in Q3 2018, is the sixteenth busiest in the United States. Prior to 1980 efforts by community organizers led by the Modern Transit Society to bring light rail to Sacramento were stopped in their tracks by a pro-bus-only Regional Transit District Administration and Board of Directors. After many months of very adverse media attention to management failures, all of the senior management was fired, and the majority of the Board either resigned or were replaced. In 1980-81, a new Board of Directors hired a new General Manager, Bob Nelson, who had been a senior manager in the design and construction of the Bay area BART system. A management troika of Nelson, RT General Counsel John Kettleson, and Public Affairs Director and Assistant General Manager Bill Green, was successful in completely reorganizing the agency, reversing its negative public reputation, and obtaining swift approval and funding for a bold new light rail project. 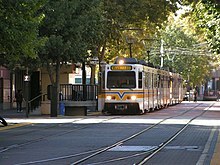 In 1987, the 18.3-mile (29.5 km) light rail “starter line” opened, linking the northeastern (Interstate 80) and eastern (Route 50) corridors with Downtown Sacramento. As light rail ridership increased, RT continued to expand the light rail system. RT completed its first light rail expansion along the Highway 50 corridor in September 1998 with the opening of the Mather Field/Mills Station. Five years later (September 2003) RT opened the first phase of the South Line, a 6.3-mile (10.1 km) extension to South Sacramento. In June 2004, light rail was extended from the Mather Field/Mills station to Sunrise Boulevard, and on October 15, 2005, a 7.4-mile (11.9 km) extension from the Sunrise station to the city of Folsom was opened. In December 2006, the final leg of the Amtrak/Folsom project was extended by 0.7-mile (1.1 km), to the downtown Sacramento Valley Station, connecting light rail with Amtrak inter-city and Capitol Corridor services as well as local and commuter buses. In August 2015, RT extended service south to Cosumnes River College. Within the next several years, RT plans to extend light rail north to Sacramento International Airport. RT currently operates 97 bus routes in a 418-square-mile (1,080 km2) service area. Sacramento RT Light Rail ridership peaked at 16.8 million rides in 2008, and has declined to 9.7 million rides 2018, a drop of 42% during that period. Before the June 2010 budget cuts, RT light rail formerly operated from 4:30 a.m. to 1 a.m. daily with 15-minute headways during the day. After the budget cuts took place, light rail service was curtailed to operate from 4:30 a.m. to 10 p.m. daily, with service every 15 minutes Monday through Friday, and every 30 minutes on weekends and at night. In 2013, RT light rail service was restored to operate more hours again, now operating from 4:30 a.m. to 12:30 a.m. Monday through Saturday, and from 5 a.m. to 11 p.m. on Sunday, although the frequency headways remain unchanged. The only exception is the Green Line which operates Monday through Friday only from 6 a.m. to 8:30 p.m. running every 30 minutes throughout service times. The stations along the network are open-air structures featuring passenger canopies for protection from adverse weather. Twenty-six stations offer bus transfer services and 22 have park-and-ride lots with a total of 10,113 available parking spaces. Works of public art included at several stations were developed as part of the RT Public Art Program, and represent an array of media including, mosaics, sculptures, metalwork and murals. Each was commissioned to incorporate an identity and sense of place unique to the neighborhood surrounding the station. The LRV fleet is composed of cars from three different builders: 36 from Siemens-Duewag U2A, some of which have been in use since the RT opened; 40 newer ones delivered in 2003 from Construcciones y Auxiliar de Ferrocarriles, and 20 Urban Transportation Development Corporation cars purchased from Santa Clara Valley Transportation Authority and refurbished by Siemens. Sacramento RT has several plans to expand the light rail system, but most have been placed on hold due to a lack of funding. The most recent Sacramento Regional Transit Master Plan, adopted September 2009 included plans to extend the system to Elk Grove, Roseville, and Citrus Heights. The Green Line to Sacramento International Airport light rail future extension Project will extend service 12 miles (19.3 km) to the airport via the Natomas neighborhood. The line would extend northwest from the existing Green Line terminus at the 7th & Richards / Township 9 station. The plan to extend light rail to the airport has been in the works since early 1990s, and is the project most requested by residents of the Sacramento region. The agency is currently completing environmental documents for the project. The project, estimated at nearly $1 billion, would be the costliest in RT's history and securing funding has been a challenge. Transportation officials most recently proposed funding the project with a half-cent sales tax increase in Sacramento County, but the measure was narrowly defeated in November 2016. ^ a b c d e "RT Fact Sheet" (pdf). Sacramento Regional Transit District. June 2015. Retrieved September 9, 2015. ^ a b "Sacramento Regional Transit District (Sacramento RT) | National Transit Database". www.nationaltransitdatabase.org. Retrieved March 14, 2019. ^ a b c "Sacramento Regional Transit Light Rail FACT SHEET" (pdf). Sacramento Regional Transit Light Rail. February 2008. Retrieved January 23, 2007. 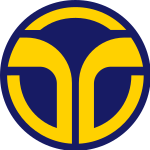 ^ "Press Releases - Sacramento Regional Transit". iportal.sacrt.com. Retrieved December 4, 2018. ^ "Art on Track – Station Art Along Light Rail" (PDF). Sacramento Regional Transit District. Archived from the original (PDF) on January 3, 2010. Retrieved February 2, 2010. ^ "Rolling Stock (LRV)". Sacramento Regional Transit. Retrieved November 3, 2016. ^ "Siemens-refurbished light rail vehicles to begin operating on new Sacramento Regional Transit line | Siemens USA Newsroom". news.usa.siemens.biz. Retrieved November 3, 2016. ^ "Sacramento TransitAction Regional Transit Master Plan: Executive Summary" (PDF). Sacramento Regional Transit District. Retrieved January 13, 2015. ^ a b Bizjak, Tony (January 7, 2015). "When will Sacramento get light rail to the airport? Not soon". The Sacramento Bee. ISSN 0890-5738. Retrieved July 10, 2018. ^ "Green Line to the Airport fact sheet" (PDF). Retrieved July 10, 2018. This page was last edited on 14 March 2019, at 19:07 (UTC).